Some people are put on this earth to make it a little brighter by sharing their gift. Dalida was one of these people. While in Paris, I was able to witness the breathtaking exhibition created in honor of the late singer/actress Dalida on the 30th anniversary of her passing. Prior to attending, I didn’t know much about her. However, thanks to this exhibit I was able to get a glimpse into her larger-than-life career and obsess over her show-stopping wardrobe in each of the carefully curated rooms. From the beginning Dalida, born Iolanda Gigliotti in Egypt in 1933, captivated the world with her music and her fashion style both on and off the stage. At age 21, she was crowned Miss Egypt but had dreams of becoming a superstar. She quickly gained notoriety as a muse to designers, everyone from Balmain to Dior to Yves Saint Laurent and Louis Azarro loved to showcase their creations on this beautiful singer. In 1954, the performance of her song Bambino, cemented her place in history as not only a fashion icon, but as tremendously talented singer. Bambino spent 46 weeks in the French top ten and remains to this day one of the biggest-selling singles in French history. Over the course of her career, Dalida sold over 170 million records and achieved international success all over Europe, the Middle East and Japan. She sang in over ten languages including English, Italian, French and Arabic, received over 90 gold records, starred in films, sold out concerts around the globe and became the first singer to receive platinum and diamond discs. However, in 1987, Dalida’s brilliant career was tragically cut short when she committed suicide at the age of 54. Heartbreaking losses in her personal life became too much for the singer. “Life is unbearable for me. The design of the exhibit made you feel as though you were immersed in a different time, if only for a moment. As you looked around at each and every one of her beautiful costumes and everyday pieces, you realized this was no ordinary woman. She was larger than life with a talent to match. The more you learned, the more you wanted to know and the more you wished she could have lived longer to continue to share her charisma, her style and her music with the world. 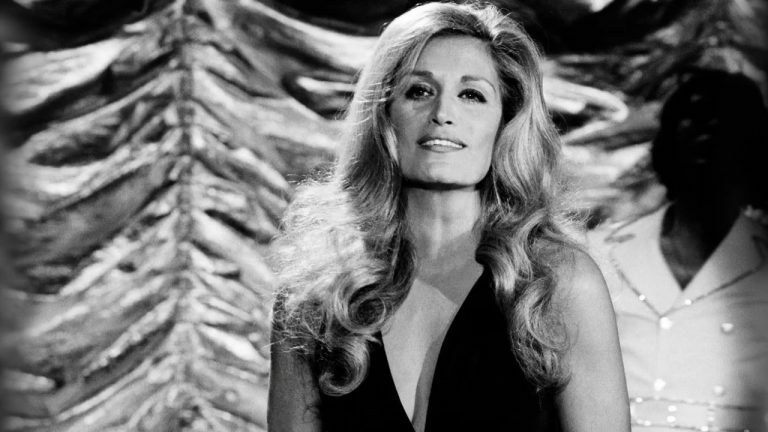 Although there was much heartbreak in Dalida’s life, it was also full of accomplishments. She was a luminous star with immense talent and the hauntingly beautiful voice of an angel who left this world a little brighter but sadly, much too soon.